Image of a menehune at the Aulani Resort on Oahu. The folklore and mysticism of Hawaii would be incomplete without the story of the Hawaiian menehune. According to legend, the Hawaiian menehune were small people ranging from 6 inches to 3 feet in height. But, they had muscular, stocky bodies able to handle hard labor. They worked with great agility and skill. They were said to have large eyes, low humming voices and would only come out at night. Similar to the leprechauns of Ireland, the menehune were mischievous, often playing tricks on people. Sometimes, they could even turn presumptuous spies into stone. Depending on the source, some say that they were an impish people, tormenting others and playing pranks. While other legends tell of the menehune’s ability to turn a normal person’s fury into joy. These playful people lived in the deepest parts of the forests and loved to sing, dance and cliff-dive. They enjoyed eating bananas and freshly-caught fish. According to one myth, menehune were so numerous on Kauai their shouting could be heard on Oahu. One legendary adventure occurred when the wily and lively menehune happened upon a sleeping giant. They then threw stones at the figure, trying to wake him. The stones filled up his mouth, which caused him indigestion and made him sleep. The giant has been eternally sleeping ever since. He still lays in the form of a mountainside on Kauai, which you can still see today. As a result, people on Kauai now call it the Sleeping Giant. 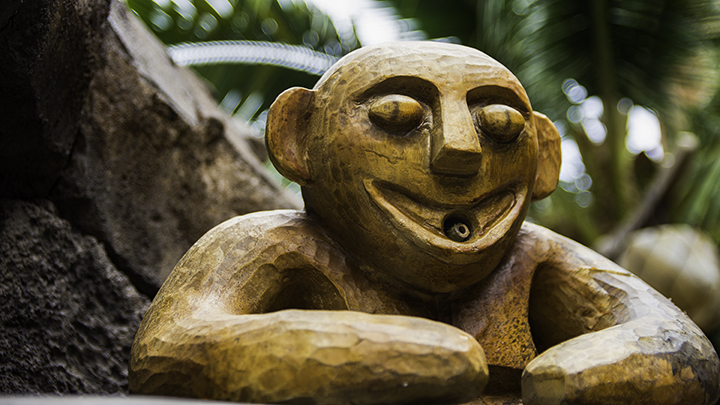 According to legend, menehune were powerful builders with supernatural strength. They worked tirelessly through the night to build astounding monuments. Supposedly, they also built fishponds, heiaus or temples, roads and houses within a single night. Alekoko or Menehune Fishpond in Kauai. Kauai was the primary home of the menehune. Here, you can see their numerous works. 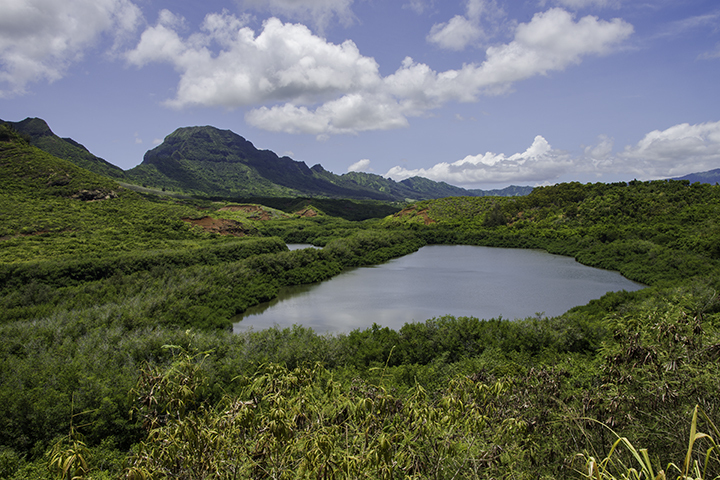 One of the most impressive sites credited to the menehune is Alekoko Fishpond. It’s nearly 1,000 years old and is a historic example of Hawaiian aquaculture. The menehune supposedly built it handing stones person-to-person over 25 miles completing the task in one night. Menehune also built the Kikiaola irrigation ditch on the western side of the island. The artistry behind this ditch is notable. This is because stones were cut with flattened surfaces allowing them to fit tightly together. This kind of hewn stone does not appear on any other part of the island. Thus, it gives rise to the legend that Hawaiian menehune created this ditch. The menehune are celebrated in Hawaii through small wooden or stone carvings of the little people. Often statues and carvings of menehune are visible in cultural centers, shops and even hotels. One such hotel is the magical Aulani Disney Resort & Spa in Ko Olina. Here, small menehune carvings peek out behind plants or rocks, just the way the mythical people would supposedly have done. No one has ever found a skeleton of a menehune in the Hawaiian Islands. However, this does not prevent some from believing that they once existed. Whenever strange and seemingly inexplicable things happen to people in Hawaii, some believe menehune are still doing pranks.